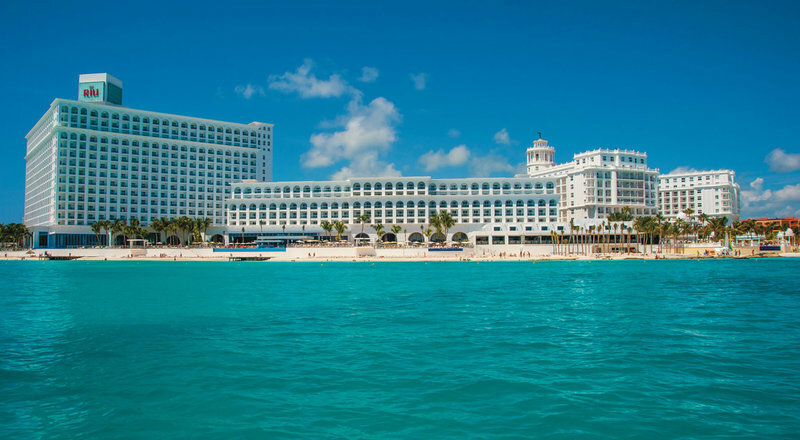 Riu Cancun is situated in the heart of one of Cancun’s exclusive hotel zone most popular areas for tourists, in a prime location on a white sandy beach with turquoise water. This land mark building tall and regal with mosaic domes, frescos and vistas of the caribbean has been giving a fresh new look in the common areas and all the rooms have been recently renovated. If you’re looking to pamper your body, we strongly recommend our Renova Spa with a wide range of treatments, as well as a gym and Jacuzzi. You can enjoy sunbathing by any of the three fresh water swimming pools. At RIU you will never be bored, as it offers a long list of activities to enjoy every day with your family, friends or as a couple. We provide a tennis court and entertainment for all ages, including the RiuLand program for the little ones and entertainment options day and night for the adults. You can watch shows, listen to live music, enjoy water sports, and dance to excellent music in the “Pacha” club at night or start winding down in the 24-hour sports bar. RIU Cancun has 569 recently renovated room and ocean-view junior suites are available, safe, mini-bar, liquor dispenser and patio or balcony, there is a fee for WiFi in the room or it is free in the lobby. With this all-inclusive resort you have many choices of restaurants and bars like the Miramar” restaurant,”La Toscana” Italian restaurant, “Kawachi” Asian restaurant, “Turquesa” poolside restaurant / grill and steakhouse, “Coral” poolside restaurant, “La Punta” lobby bar, “La Fiesta” lounge bar, Sports bar (open 24 hrs, All Inclusive service), “Corner” bar, “Wet’n Drinking’pooll bar.